We spent our tech weekend and dress rehearsals doing what we normally do on tech weekend and dress rehearsals–doing everything we can to make a good show great. We often talk about the “magic” of theatre, as if the nitty-gritty details of putting a show together are just unfortunate necessities (boring stuff like working out blocking, memorizing lines, and fine-tuning technical cues). But preparation is vital in the theatre. We prepare and prepare and prepare so that when we step out onto the stage (or into the booth, or take our seat in the audience, critical eye and notebook at the ready), we can lose ourselves just enough to take our audience with us. Our phenomenal cast is prepared. When the lights came up on them at last night’s dress rehearsal, magic happened. They’d moved from knowing what they needed to do as actors, to understanding their characters’ motivations, to embodying three brave women trapped in horrific circumstances. It’s in them–in their faces, their voices, their bodies, and their hearts. Obviously, as the production dramaturg for Nordost and co-artistic director of the Troika Collective, my opinion is extremely biased, but I could not be more proud of these actors, our director, or our designer. What these women gave of themselves to bring this show to life in Vancouver (a North American premiere, no less), is beyond my ability to thank them. I have no idea what good deed I must have done to deserve to add my name to the program alongside them but I could not feel more privileged. This is a damn good show. And an important show. In the buzzing silent moment after the dress run and before the cast had taken their bows (it’s good to practice them, even with no audience), I couldn’t help but reflect on Nordost‘s story of trauma, terrorism, and desperation, and think, “And we’re doing it all again.” The world is not so different now than it was in 2002–except maybe we’ve become used to things we shouldn’t be used to, and maybe we haven’t learned as much as we should have. This play is serious, yes, but also necessary. Nordost will be playing at the Havana Theatre (1212 Commercial Drive) March 4 – 7. All shows are at 8:00 p.m. Tickets are $20/$17 and can be purchased online at Brown Paper Tickets or at the door (cash only at door). 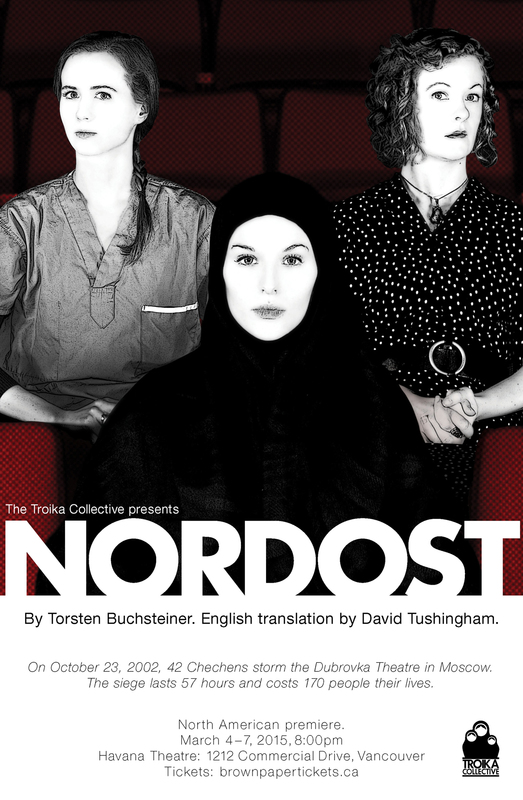 David Tushingham’s English translation of Torsten Buchsteiner’s Nordost was originally commissioned by Company of Angels, London, and first presented at the Salisbury Playhouse Studio in April 2013.